Gucci will be celebrating its 90th anniversary come 2011. 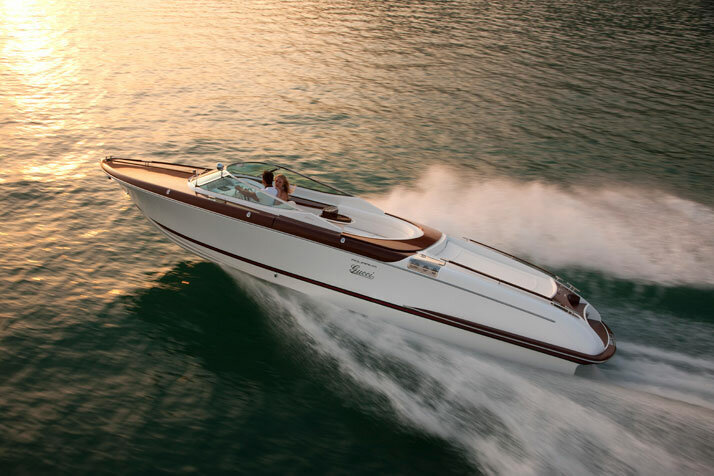 For the celebration, Gucci has teamed up with yacht building company Riva to offer clients made to order speed boats next year. AquaRiva by Gucci is 33 feet, powered by 380-horsepower Yanmar engines, and is made to achieve a maximum speed 41 knots and boasts of a 150-mile range at cruising speed. It also has a fiber glass hull, a mahogany deck, and it has Gucci’s signature green and red stripes. In addition to that, the vessel comes equipped with a range of Riva by Gucci accessories, including bags, towels, deck shoes and flip-flops. The boat was revealed at the International Cannes Boat Show on September 7. It will appear again on September 22nd during the Milan fashion week. The starting price for the AquaRiva is 750,000, the Aquariva is going to be exclusively made-to-order basis through Riva’s dealer network.